SINGAPORE (AP) -- A sharp drop in Chinese stocks led global markets broadly lower on Tuesday, as investors digest the impact of trade tensions on the country as well as other geopolitical worries, such as Italy's debt problems. After the Shanghai index closed down 2.3 percent at 2,594.83, European markets traded lower. Germany's DAX slipped 1.8 percent to 11,321 and France's CAC 40 was 1.3 percent lower at 4,990. Britain's FTSE 100 lost 0.7 percent to 6,991. Wall Street is forecast to open lower, with the future for the S&P 500 down 1.1 percent and the Dow future off by 1 percent. Traders appear to be weighing anew the impact of increased tariffs on most Chinese goods sold to the U.S., ranging from soybeans to electric cars and whiskey. Recent data showed China's economy grew at a 6.5 percent annual pace in the third quarter, its slowest since 2009. Hong Kong's Hang Seng index sank 3.1 percent to 25,346.55. 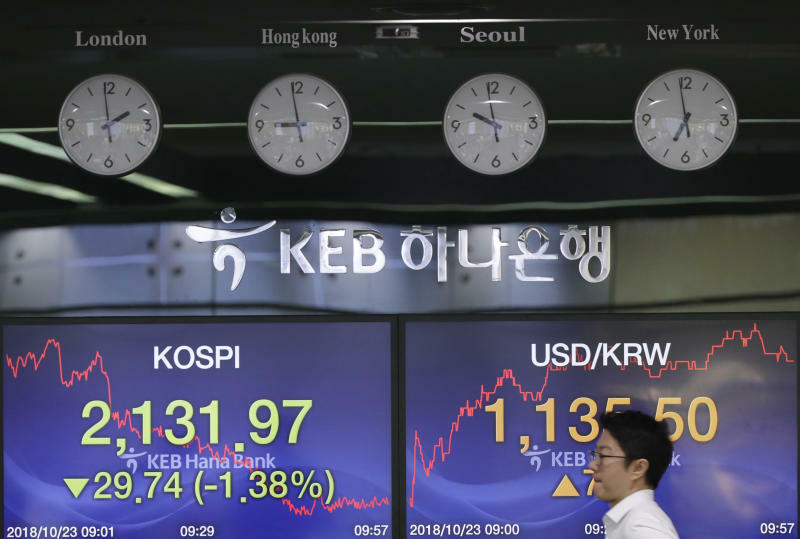 Japan's Nikkei 225 index gave up 2.7 percent to 22,010.78 and the Kospi in South Korea tumbled 2.6 percent to 2,106.10. Australia's S&P-ASX 200 dipped 1.1 percent to 5,843.10. Margaret Yang, market analyst at CMC Markets in Singapore, said "investors are starting to price in weaker-than-expected third quarter GDP readings amid intensified trade frictions." Several large U.S. businesses, which are due to report third quarter earnings later in the day, could either provide markets with much-needed tail winds or rock them further. Underperformance by companies like Caterpillar, 3M and Verizon could be taken as a sign that rising interest rates, inflation and trade disputes are weighing on the global outlook. The European Union is worried that this would prevent Italy from lowering its debt, which is second only to Greece among its members. International credit rating agency Moody's has downgraded Italy's credit ratings in response. But Italy's Premier Giuseppe Conte called the budget "well-conceived" and said the country's economic "fundamentals are good" a news conference in Rome on Monday. "Risk aversion continues to permeate every pocket of the markets whether triggered by President Trump's latest tweets on immigration or the blustery headwinds from Riyadh to Rome," Stephen Innes of OANDA said in a commentary. The price of oil was lower despite tensions surrounding Saudi Arabia over the disappearance of a dissident journalist. The leader of Turkey accused Saudi Arabia of premeditated murder, which the Saudis reject. A big investment conference got under way in Riyadh, despite the cancellation of several top names who had been invited to speak. Benchmark U.S. crude lost $1.22 cents to $68.14 per barrel in electronic trading on the New York Mercantile Exchange. The contract added 8 cents to settle at $69.36 a barrel in New York. Brent crude, used to price international oils, fell $1.73 to $78.10 per barrel. In the previous session, it gained 5 cents to $79.83 a barrel. In currencies, the dollar weakened to 112.33 yen from 112.82 yen on Monday. The euro edged down to $1.1462 from $1.1465.